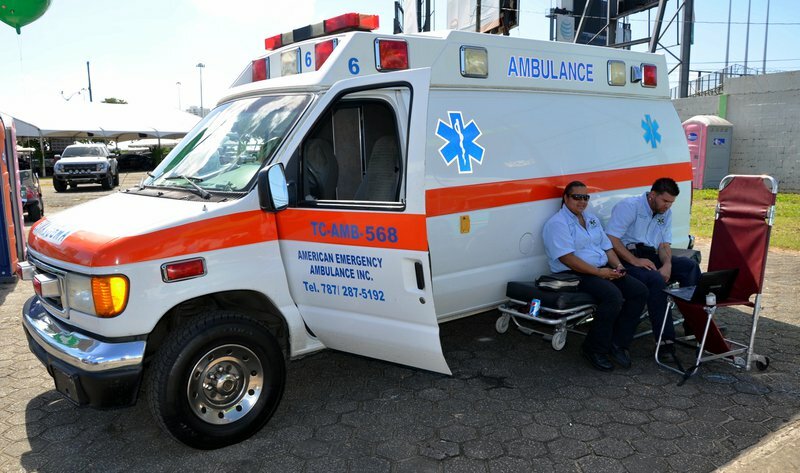 A seldom talked about side effect of the opioid epidemic has been the strain on Emergency Medical Response (EMS) personnel because of their duty to respond to overdoses. Those serving at local fire and police station have seen the impact of the epidemic firsthand handling overdoses. Compared to their roles a few years ago, this represents a major change. Some communities have now started mapping EMS calls for overdoses as a first step in showing how overwhelming the epidemic is for EMS personnel. Maps like these also help them prepare their staff for calls with Naloxone, create awareness for the public, and spur the creation local advocacy groups consisting of health professionals, counselors, and those who have been personally impacted. With data like this in hand, advocacy groups have been able to do more targeted education outreach and stock public places, such as nearby libraries, with Naloxone along with providing the training sessions on how to use it. 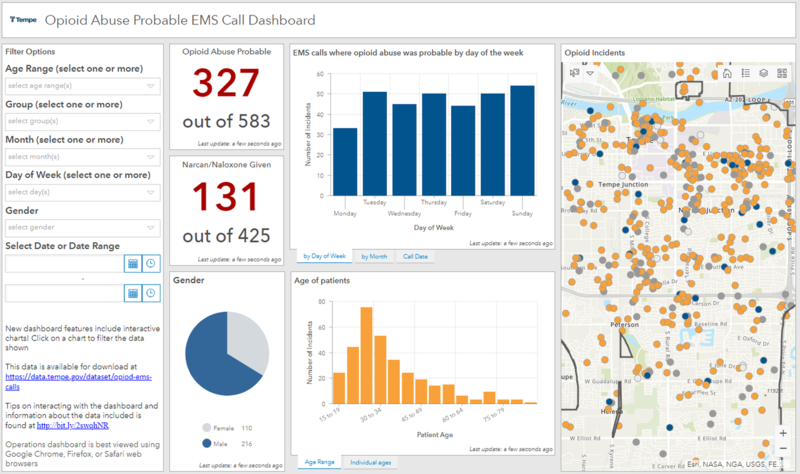 One such effort by the City of Tempe, AZ, has resulted in the launch of their Opioid EMS Dashboard. The public-facing application, which shows nearly 500 points from the last year, presents a powerful visual that they hope will lead to action. Stephanie Deitrick, who leads GIS for the city knows that “the city isn’t going to address this by themselves,” and so is looking forward to the community’s response. By further tracking the demographics of overdoses and the days of the week they arrive on most typically, the city is creating a more complete picture for citizens looking to get involved. The city is also conscious of individual privacy, however, so they randomize the points to not show the exact location or personal information of any caller. Tempe also recently began participating in the Opioid Mapping Initiative, a regular convening of several local governments who share the work they do with data and maps for the epidemic. By doing so, Tempe inspired another participant in the group, Northern Kentucky, who has been tracking data for some time via a story map, to obtain their own EMS data. They have now created a similar map of EMS responses, noting that it represents a conservative underestimate based upon the data from several counties. Local governments often fear that people may not want to move to their town if they expose this data, or that publishing it will ruin their relationship with local universities where hotspots may appear. 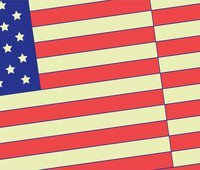 But as the work of those in the Opioid Mapping Initiative shows, open data transparency allows local governments to address current problems in their community that may be causing far greater economic issues. Avoiding these problems to spare the city from bad publicity can create much more complex problems later on, while confronting them now, like Tempe and Northern Kentucky are doing, has shown to be a more effective approach. Tempe and Northern Kentucky’s work on mapping is an integral strategy to combating the opioid epidemic— but it is just as important to remember that each overdose dot belongs to a real person with family members who love them. 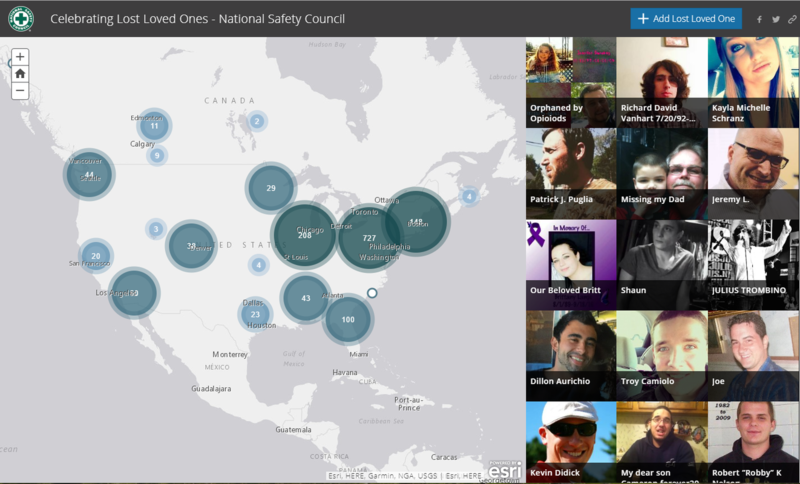 Celebrating Lost Loved Ones is a crowd-sourced map of nearly 1,500 people that have been lost to the epidemic, and serves as a good reminder that exposing real data, as Tempe and Northern Kentucky are doing, is about more than providing visuals— it’s about saving lives.